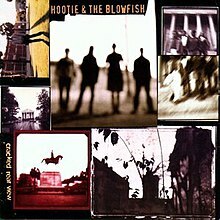 HOOTIE AND THE BLOWFISH: CRACKED REAR VIEW: 1994: 3 1/2 STARS OUT OF 5 STARS: This album is the 14th best selling album ever in the United States. In the mid 90’s this was an album half the population seems to have bought. My predictions on things can be all over the place- I once predicted Madonna was a flash in the pan and would be a trivia question by the end of the 80’s- wrong on that one but I was right about two artists from the mid-90’s- I didn’t see Hootie and The Blowfish or Alanis Morrsette having any staying power and I think I was proven right. Oh I know Darius Rucker has went on to be a big country music star but I bet he hasn’t sold his entire career put together- as many albums as this one did. It is a pleasant pop album- it had four Top 15 hits. It was an influential album- a friend of mine had a daughter in 1995 and they named her Hannah after the opening song on this album. The album is a nice listen- it won’t offend anyone. If you were hosting some gathering with a lot of people and this was playing probably no one could complain- it’s not like you would be blasting out Captain Beefheart. Hootie’s follow up album also went to #1 but that was only because of the debut- you were bound to have some people ‘Oh Hootie has a new album out-” and scoop it up before listening. Each album was less popular and after five they called it a day. One thing I learned from this- even the Dolphins make Darius Rucker cry. He does seem rather sensitive. HOZIER: HOZIER: 2014: 4 STARS OUT OF 5 STARS: When I first heard “Take Me To Church” I thought- this is the best Elton John single in years. Then I heard it was some fellow named Hozier and not Elton. Take Me To Church one of the better singles in recent years and the debut album as a whole is a winner. Other songs that stick out to me- Jackie and Wilson, From Eden, Like Real People Do, Someone New. It has been 3 1/2 years since this came out- looking forward to Hozier’s second album. Has Hozied released another project since? I haven’t kept up with him. No nothing since September 2014 when this came out. Maybe coming up with the second album isn’t as easy. I haven’t read anything about an upcoming album. Wow, I had not heard that name, Hootie & The Blowfish, in a long time! I guess you’re right, they were everywhere during their height of popularity. I don’t recall having ever heard a Darius Rucker solo song – in part since I generally don’t follow country music. Technically, it appears Hootie & The Blowfish are still together and perform occasionally, according to Wikipedia. BTW, it’s funny you mentioned your initial take on Madonna. After I had listened to “Like A Virgin,” I pretty much had the same reaction, dismissing her as “a dumb blonde” – I know, sounds terribly sexist! That was certainly wrong. While I never became a fan, you got to give it to her that she wrote many catchy pop tunes, some of which I like, such as “Borderline”, “Papa Don’t Preach” and “La Isla Bonita”. Also, the thing is, Madonna actually did write her own material and plays guitar. And then her constant reinventions in the form of different personas. While I didn’t necessarily like all of it, I certainly have come to respect as an artist. I haven’t heard any of Darius Rucker’s solo stuff either-what passes for country music today is pretty lame. My brother reminds me every now and then about my declaration that Madonna wasn’t going anywhere. I love her singles up until the early 90’s– since then only a handful have struck me- Ray of Light for example…. I also essentially stopped paying attention to Madonna starting sometime in the 90s! As for Country, I guess I have to be a bit careful about making general statements, since it’s become such a broad genre with so many cross-over acts, some of whom I actually do like. For example, some of Cheryl Crow’s music and even John Mellencamp, an artist a dig big time, occasionally have crossed over into country. Frankly, sometimes distinguishing between Country, Americana and Roots becomes a bit artificial. Ultimately, if I like the music, I don’t really care about the genre! Yes I have noticed that we do seem to have similar music tastes. The country that I like is the old classic country- not this Garth Brooks influenced crap! Today the true country music has to be the Americana and roots artists. I have not listened a lot to some of these popular country radio acts of today but I’ve heard enough to know what I don’t like. Forgot to ask- was the Aretha concert you were going to go to one of the ones that she cancelled? Yep, unfortunately! It would have been tomorrow coinciding with her 76th birthday. Given her age, I hope it’s nothing serious – a 2-month break ordered by her doctor sounds like a long time to me and more than just a cold! I could be mistaken but I think she has had health issues in the past. Hopefully a full recovery. Yep, I seem to recall hearing about health issues in the past as well. Last year, Franklin officially retired from touring. Then she told the Detroit News she was planning to open a night club in downtown Detroit where she would perform every now and then. As such, unfortunately, tomorrow may have been the last opportunity to see her in the tri-state area. John Fogerty and ZZ Top and PNC Bank Arts Center in May. Still, it’s somewhat bittersweet. Have you ever seen Fogerty before? I saw him around twenty years ago- very good. The one thing that really struck me is- he really seemed to be enjoying doing what he was doing. He was having a good time and not rushing to get off the stage. You remind me I need to look into getting tickets for the show when he is in this neck of the woods. Nope, it will be the first time. Same for ZZ Top, so I’m excited. You are in New York, right? They are playing Jones Beach on June 20. I am in eastern Ohio. They are to play in Youngstown about an hour an a half to the north- in June. For some reason, I thought you live in the New York area. They are playing the Covelli Centre in Youngstown on Tue, June 19. I just watched a clip on YouTube from 2016 of John Fogerty and Billy Gibbons playing “Sharp Dressed Man.” They really seemed to have a ball – think I’m going to post it! I suppose Hootie And the Blowfish lyric “ The Dolphins Make Me Cry” would be my local team’s theme song in the post Dan Marino era. Yes- Darius Rucker is a Dolphin fan… and the way they have played the past few decades I can see how a diehard fan would be driven to tears.